NOW more than ever, you need a great web presence to get more appraisal work. With the new HVCC requirements, your website is the key to increasing estate and FHA appraisal orders. Your website must be on the first page of search results to get online orders. How many orders do you receive online? Having the top ranking website in our area, we receive numerous FHA and Estate appraisal requests on a weekly basis. The majority of orders are to help customers going through a divorce, partnership dissolution, date of death/probate and for private investor transactions. Approximately 50% of the appraisals we complete have been ordered online, with the other 50% coming from Appraisal Management Companies. This gives me the ability to select the highest paying and most enjoyable orders from the Appraisal Management Companies. If we didn't get more than 50% of our business from our website, we would be forced to complete low paying appraisal requests just to pay the bills and stay in business. In todays market, you need a top ranking website succeed. Although we can not guarantee you will have a top ranking website, we can guarantee you will get more work if you have a website hosted with us and complete a few extra website marketing tips and techniques that we will send out to you after you sign up. Use your primary search terms and find out if you are on the first page of results in Google. Your primary search terms will most likely be the City name followed by Appraisal. [click to enlarge] Our website, Appraiseallrealestate.com, is in the most saturated appraiser market around. Try searching our primary keywords: 'san diego appraisal' to see where we rank. We try to focus on showing up on the MAP, so look at the listings between #3-7. The top spots no longer get the most clicks when people are searching for an actual service. You want to be on that map and we will show you how. How do you get a top ranking website? There are numerous requirements to create a top ranking website. A site that is properly optimized will be seen as important and relevant in the eyes of the search engines. Elevate your site's importance and your site will rise to the top of the search result pages. Our highly optimized website building techniques and industry related link exchange will allow the search engines to find and index your website quickly, which results in top ranking results. Get a website today and we will also submit your website to the top search engine directories and submit your new website to additional Appraiser Directories for free. You will have the ability to edit the content of your website and change the template at any time. For a limited time only we are offering a special discounted price so you can maximize your internet exposure. By having multiple optimized websites focusing on your primary market areas and services will increase your online presence as well as orders. 5 Websites for only $1000 annually. Make a list of the websites your are considering and email them to me: bryan@appraiserwebsites.net. I will review them and go over your primary search terms. I will then let you know the top 5 to use and you can purchase them online. Our appraiser link exchange allows other appraisers outside of your market area to provide a link to your website from theirs. It is considered the most effective form of search engine optimization (SEO) because it improves your websites importance in the eyes of the search engines. 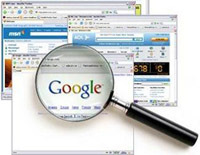 If there are numerous websites that list you as an appraiser for a certain area, the search engines will see that other website owners find your website relevant to finding an appraiser in your area. Most search engines rank websites in terms of link popularity and the more links there are to your website, the better your chances of appearing on the first page of search results. 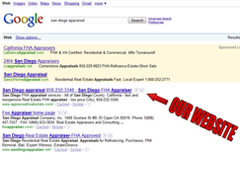 There are no companies that are building search engine optimized websites only for appraisers. Have you ever seen an alamode™ XSite™ or ACI365™ rank well in the search engines? Lack of proper page names, inferior page formatting, poor linking and duplicate content all result in poor rankings. Google and the other major search engines are interested in gathering and cataloging as much high quality and unique content as possible for human consumption. They look to minimize the amount of duplicate content they allow in their index and will ban websites from their results when found. This is why creating a new website with their automated systems and simply filling it with third party content will rarely if ever result in high rankings in the Google index. Having a website that is not optimized for the search engines is like buying billboard advertising in the middle of the desert. Someone might come across it from time to time, but they won't be looking for your appraisal services. When you purchase a website you will have a very easy to use interface that will allow changes to the text of the pages, ability to insert images and documents and easily change the template/design of the entire website with a few clicks of your mouse. So many people have asked to see samples of some of the websites we create that I decided to put up some samples of the templates we use that have already been customized for appraisers. There are literally thousands of free templates available online. By now you should know the benefit of having a search engine optimized appraiser website. Although we can’t guarantee you will rank #1 in your area, we can guarantee that you will get more appraisal work by having a website with us and following the additional tips and techniques we send you from time to time via email. If you decide to JOIN the Appraiser's Club TODAY not only will be build you a search engine optimized website, but we will create a custom video for you! This is a limited time offer, so take advantage of it before it is too late! Here are samples of all the design templates you can use for your website. All you need to do is to log in to your website (the log in information was mailed to you – search your email for your domain name). View your website in another window or tab. You can change the appearance as many times as you would like. Most people do not order appraisals online, they call, ask a few questions and place orders over the phone. If you do not have a website that ranks, you are never going to get those phone calls from clients looking for appraisal services for bankruptcy, estate purposes, divorce and even bail bond orders (VERY LUCRATIVE). This is a limited time offer. Sign up TODAY. AppraiserWebsites.net will purchase and host the domain for you, as well as providing all the initial setup and search engine optimization work for your appraiser-specific website- a service worth thousands of dollars elsewhere. This process makes it easier to get your website up and running quickly, and showing returns for you as soon as possible. If you would like to transfer the domain name/website any time after the one year agreement term, no additional fees will be charged. The hosting and maintenance fee after the first year is only $250 annually. Use this form to place your order, we will then contact you via email.